Located in Ogilvie Transportation Center, the Chicago French Market was one of the first indoor food halls to hit Chicago in 2009. The market is now home to over thirty vendors with an array of international cuisines, satisfying any and all cravings for breakfast, lunch and to take home on the Metra. Below are just a few of the places to check out on your first or next visit. Life-changing Gumbo Mac & Cheese. Enough said. This lobster king started as a food truck and then quickly added a counter in the French Market to cater to more people. Order the Chicago style lobster roll loaded with fresh lobster and topped with giardinera, blanketed by a soft, warm New England hot dog bun. The small bar offers commuters awesome Belgian food including their Belgian fries served with ketchup and garlic mayo dipping sauces. Accompany the fries with any of Frietkoten’s signature burgers and Belgian beers and you can find your taste buds in the heart of Brussels. Frietkoten is also a great spot for the market happy hour on Wednesdays and Thursdays where guests can enjoy $4 bottle and cans and $5 wines by the glass. A Montreal-style deli with some knock-out pastrami. The pastrami is thicker and fattier than your typical New York deli pastrami. The skin is perfectly peppered and the meat smoothly tears off the fat with each bite. Come during happy hour and get pork sliders 1 for $2.50 or 3 for $6 or mini hot links 1 for $3.50 or 2 for $6. Take a guy who lived in Shanghai for ten years and his passion for food and you get Street Smoke & Steam. This Chinese Street Food serves up flavorful fast food for a reasonable price. The XinJiang Lamb is marinated overnight with onion, soy, tamarind, cumin and chili powder then dusted with a Street spice blend. The lamb is then served with a house made lamb gravy on the side, a fingerling potato pancake and Street slaw. Another flavor punch is the Hoisin Beef that is marinated overnight in sake, soy, Asian pear, garlic, ginger, sesame oil and hoisin then glazed with Street hoisin BBQ sauce. The beef is served with a delicious Street rice that is sautéed in the aforementioned lamb marinade. The Fines Herbes Jardinière Swiss Gnocchi is the dish to get here. The light and puffy gnocchi is accompanied by sweet yellow peppers, mushrooms, scallions, pine nuts and strips of basil. It is completely vegetarian and packed with a wonderful array of flavor. The best part is the smaller-than-usual portion size is filling without feeling like you just ate a full dinner plate. For a refreshing afternoon bubble tea, B.I. Tea offers a frequent buyers punch card. For every ten drink purchases, you earn a free drink. Don’t like bubble tea? B.I. Tea caters to every tea lover with a variety of milk or fruit tea choices in hot or cold with options to add or subtract the amount of sugar or ice, add in boba or fruit or even make it vegan! This San Francisco-based chocolate and candy counter offers every truffle flavor one could think of. Their signature truffles include s’mores, cookies and cream, dark chocolate with sea salt, and coffee. Lolli’s cases are filled with colorful chocolates at a reasonable price and even feature marzipan shaped into fun foods like tacos, burgers or tomatoes! The coolest thing about this stand is their candy jar offer. For a one-time fee of $99, plus the cost of the jar ($12) and the first refill ($17) one can fill up for FREE for the whole year! That’s 52 weeks of virtually free chocolate. Can’t pass up deals like that when it comes to chocolate! Firenze Italian Street Food will bring the street food of Florence, Italy to the Chicago French Market by offering simple, authentic, and homemade options. 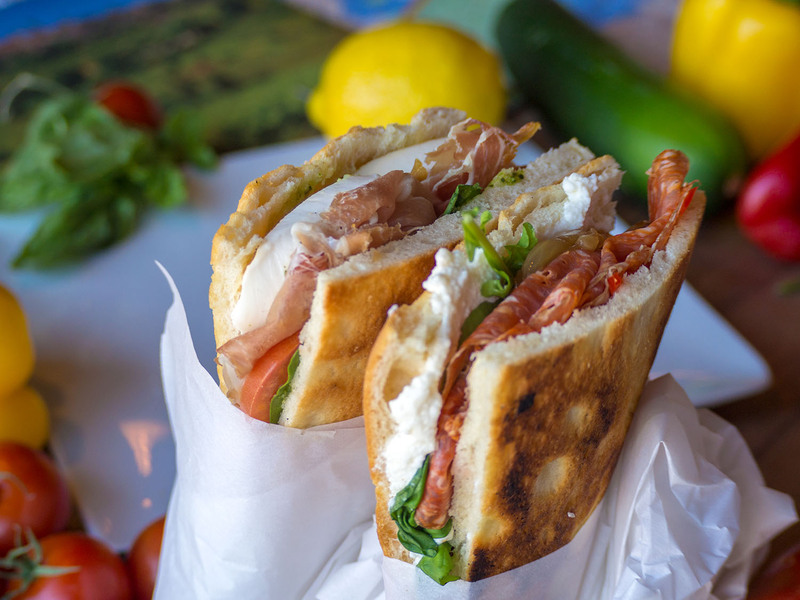 All of their high-quality ingredients can be enjoyed as a sandwich on homemade schiacciata bread, brushed with extra virgin olive oil and sea salt, a salad over marinated kale or mixed greens or simply as an antipasto plate. Tiger Ceviche will add a healthy and fresh option to the Market with three delicious Ceviche recipes daily. Featuring fresh fish, fruits and vegetables, Ceviche is rich in protein and offers a healthy, yet filling meal. This is the first location for Tiger Ceviche founded by Mark Czubak, a restaurant veteran and self-taught chef. From the owners of market mainstays Loop Juice and Loop Soup comes Pierogi Crib, a Modern Polish Kitchen. Expanding upon their Pierogi Rig food truck offerings, Pierogi Crib will bring a selection of Polish favorites such as freshly made pierogis, blintzes, potato pancakes, and golabki to the French Market. For a full list of vendors visit the Chicago French Market website and follow them on social media to keep up with all of the delicious news! Hang out at the market for happy hour Wednesdays and Thursdays from 4:30PM to 6:30PM featuring specials at a number of market vendors and live entertainment. For more information on participating vendors and February specials, visit the events website. The Chicago French Market is open Monday through Friday from 7AM to 7:30PM and Saturdays from 8:30AM to 5:30PM and closed on Sundays.